NEW! 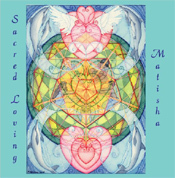 Sacred Loving - A memorable collection of moving songs with beautiful, full-sound orchestration and compelling production by talented composer, Bradfield, gorgeous female vocals by singer, Anael and the familiar, resonant depth and purity ever-present in Matisha’s music. From a rarified softness to stirring heights of joyful song, these pieces bring to life the aspiration of unconditional love. Teeming with presence, vocals that pierce the veils to a realm of Sacred Loving -- powerful, angelic voices soaring throughout a rich soundscape, uplifting the listener to heavenly heights... Includes: Opening In Prayer, Ancestors, Bright Star - Bright Angel, Sacred Fire, and Dolphin Love. Becoming a favorite of many! 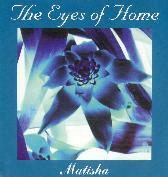 The Eyes of Home - Powerful songs for opening, healing and union on the journey Home. Remarkable guest musicians on keyboards, flute, percussion and female vocals, along with the clear tones of Matisha's voice, blend together uniquely to create a moving soundscape out of which beautifully colored melodies pour forth, through a lush interweaving of amazing voices. Two spontaneously written, instrumental pieces -- one on the harp. Includes: The Dolphin Song, When I Look In Your Eyes, I See Your Beauty, & Ishq Allah. Our Home in the Heart remembered. Many use these albums while driving, for massage and healing sessions...Read some of their comments. Important Message: Please let us know if you work for, or are involved with a healing center, Hospice center, hospital, retirement home, school, etc., that has interest in using this music for their patients/students and making it available for their healing journey and listening pleasure. The music is available for FREE, for the above purpose, through the ministry of Ecstatic Journey Home. New Leaf Distributing and DeVorss & Co.
Mahalo (Thank you) for your interest and loving support!